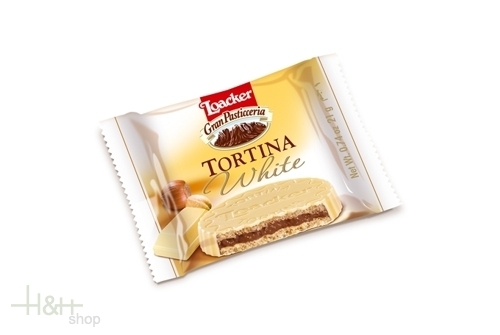 If you appreciate the subtleties of the best chocolate, if you love submitting to the pleasure of the finest Loacker creams, if you cannot resist the superior quality of our deliciously light wafers then, just for you, Loacker has created a sensation without equal: Tortina Loacker. A sublime taste experience to savour and share whenever you feel like a moment of exclusive and refined enjoyment. Tortina White: A heart of smoothest cream the finest hazelnuts captured between two light and crisp wafers and then wrapped in exquisite white chocolate. Gran Pasticceria Tortina Dark Noir 21 gr. - Loacker 1,50 EUR / 7,14 €/100 gr.